The Occasionist: Weeknight Dinner Party: Yikes! They'll be here in an hour! Weeknight Dinner Party: Yikes! They'll be here in an hour! People seem to have this conundrum a lot: How will I have time to prepare a dinner party when I only get home from work one hour before my guests arrive? My advice: Keep It Simple, Prepare Ahead, and let it be a Casual Affair. Don't let working all day deter you from hosting a dinner and enjoying your friends' company during the week. It doesn't have to be a stressful event. I’ll continue to offer more menu and set up ideas, but here is one from this week. We had talked about going out to a Mexican Restaurant, but ultimately we decided to eat at my house. I did my grocery shopping two evenings before the dinner. The next evening I made the enchilada sauce, cooked the chicken and shredded it. 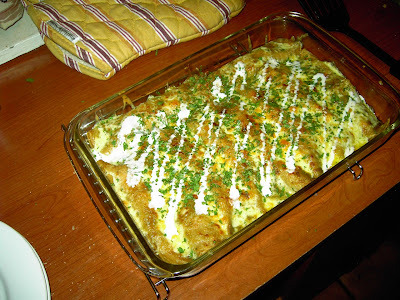 I have some amazing green chili powder from New Mexico that makes a great seasoning for an onion-based enchilada sauce. 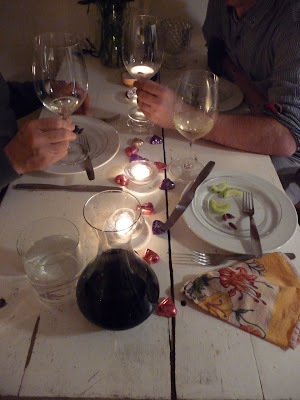 I had some Valentine chocolate hearts which I scattered down the center of the table. They livened up the table and looked good with the pink roses I got for Valentine's Day, and they also served as dessert so I didn’t need to make one myself. When I got home the night of the dinner all I needed to do was assemble the meal and set the table. Or so I thought.... There was one unforeseen hitch in my perfectly timed out plan. I had ended up painting walls all day so I was speckled and smeared with yellow paint. I hadn't foreseen that I'd need time to shower and change my clothes as well, so I answered the door in my paint splattered jeans and tee shirt. What can you do. A bit of paint-dipped host didn't seem to bother anyone. We had a delicious post work day meal, took our shoes off, and enjoyed one another's company. Mmmm this looks easy, fun, and fantastic! I'd love to get that enchilada recipe! Looks delish!! Great tips!